The only federal law formally preventing the U.S. Department of Justice from prosecuting medical marijuana businesses has once more been given a new lease on life. 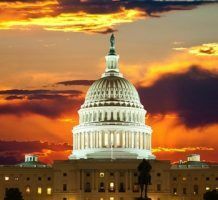 This time, the Rohrabacher-Blumenauer Amendment – formerly known as Rohrabacher-Farr – has been extended until March 23 under the budget deal passed by Congress and signed Friday morning by President Donald Trump. This is the eighth time the amendment has been temporarily extended by a continuing resolution from Congress, which hasn’t passed a new federal budget since 2015. Rohrabacher-Blumenauer prohibits the DOJ from using federal funds to interfere with state-legal MMJ laws and companies. The measure does not protect recreational marijuana businesses. Because Rohrabacher-Blumenauer has been approved in the past only as an amendment to the federal budget, the law’s lifespan is tied to annual renewal by Congress. The GOP-controlled Congress has not approved a new budget since 2015, instead having repeatedly delayed negotiations over a longer-term budget until recently, so the longer-term fate of the amendment is still uncertain. It’s possible the amendment will be included in a larger spending package that is expected to be approved by March 23. But there’s no guarantee at this point, given a change in procedural rules in the House of Representatives last year that has prevented amendments like Rohrabacher-Blumenauer from being added to the budget. A glimmer of hope came from the Senate Appropriations Committee last year, however, when Vermont Sen. Patrick Leahy got the amendment added to a Senate version of the spending bill. Proponents of the amendment note that it has overwhelming popular support in the House as well. Can they just stop being afraid of being labelled the congress that “legalized cannabis”? Have some confidence and make this permanent so we can get on with safe, jobs creating, normal business for a product with known health benefits. The vast majority of the population is behind you! The benefit out way the the not proven proclaimed risks! No one has over dosed. Technically this amendment only does the following: “None of the funds made available in this Act to the Department of Justice may be used to prevent any of the states from implementing their own laws that authorize the use, distribution, possession, or cultivation of medical marijuana.” I read this as only “preventing” the DOJ from using funds from this “particular act” in interfering with states who want to pursue marijuana legislation, it doesn’t say that they can’t interfere in any prosecutorial manner. The fact of the matter is that there is NO formal federal protections for ANY marijuana operation-IT IS STILL ILLEGAL EVERYWHERE FOR EVERYONE UNDER FEDERAL LAW! You’re still a criminal if you are growing, processing, and using marijuana for ANYTHING! Don’t become complacent and comfortable, disobedience doesn’t win in the court of law. The Cole memo was the real help, but with that gone and this amendment of little worth, comprised with the one factor that really matters- the DEA still considers ALL forms of Cannabis ILLEGAL!!!! Cannabis is pretty much where its always been, an illegal commodity with NO LEGAL PROTECTIONS! If the market wants to make real change then you have to change the politics and the laws first, nothing else matters before the fact! Any threat to their getting high legally sure brings out the drug users by the droves….unsubstantiated medical claims and promises of Big Bucks to all…Utopia! Anyone for heroin? Think of it, a “snake” started it with similar promises for just a couple of bites of an apple. Sounds to me like the usual progressive tripe we republicans are sold daily by Big Media and other “catch the wave” political opportunists. steamboat…..time to stop being a child and grow up a little bit. Your statement is so off base and colored with so much ignorance it pains me to have to even acknowledge your pitiful mind. I think you have a lot of education and reading that needs to be done before you start plunging into religion, politics, or anything that deals with medical issues. your post is absurd ad filled with lies – Are you Jeff Session by chance or do you work in the Pharma, alcoholic beverage, tobacco industry, or private prison industry ? 1. Threats to using MJ legally does not bring MJ users out by the droves – we are always here and active. 2. Clinical study data demonstrates the value of MMJ for several conditions and symptoms’ management and the number of trials being conducted and the data being published is growing quickly. Further MMJ is not just THC. CBD therapy study datasets are growing and many people are using CBD products to treat conditions and symptoms’ without getting high. 3. connecting heroin to MJ is appropriate when talking about new treatments for heroin addition. Connecting them as equals – the slippery slope and gateway arguments have been proven false and are myths. 6. There is no ‘progressive tripe’ on MJ legislation at this point in time. the majority of congress supports the end of federal prohibition, the majority of citizens support it, the majority of local law enforcement supports it, the medical community supports it. So if you are Jeff Sessions, how about looking at facts from 2018 instead of the myths used by conservatives – Nixon and then Reagan to start with – 40-50 years ago and by the govt closer to 100 years when they published Refer Madness. I often wonder if its the Pharma, alcoholic beverage, tobacco, or private prison industry lobbyists that make Jeff sessions such and strong opponent to the end of federal prohibition, or if it is racism. The black an latino communities are the targets and victims the vast majority of the time of outdated MJ laws (before you try to argue against this I suggest you research the issue – the data is incontrovertible) which means he won’t be able to use MJ as a vehicle to imprison non-whites. So which is it – are you Jeff Sessions, do you work in the Pharma, alcoholic beverage, tobacco industry, or private prison industry, do you just like to troll boards, or do you lack the aptitude to base your position on truths and facts readily available online? It is pretty easy to research online, check out https://www.google.com/search?&q=online+research+tips for 17,500,000 web resources if you need training or a refresher course. Steamboat…I believe the call for Heroin was sounded by the Doctor/ Pharmacist crew back in the mid 90s. They are called synthetic opioids…now look at the mess the Legalized drug dealers made! If there is no substantial evidence that the plant is more gentle it is only because it is illegal to study it. The game is rigged .